This isn't in GWR territory, but is of obvious concern to all. 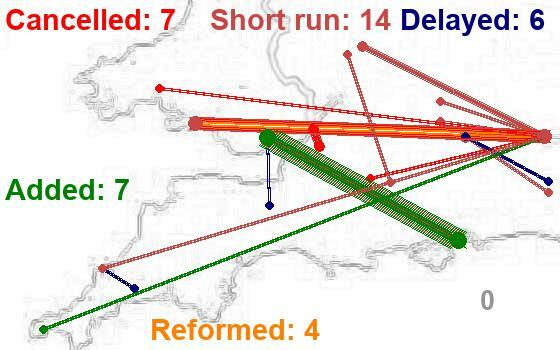 If a fire can break out at one major station, it could happen at any of them. 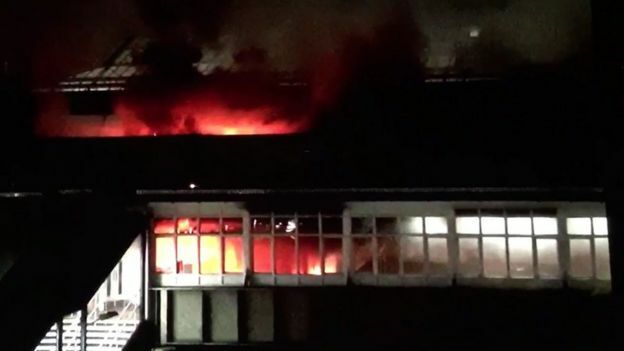 A huge blaze has closed Nottingham railway station, causing major disruption. At its peak 10 fire crews were tackling the fire, which began at about 06:30 GMT. Flames were seen coming from the station's roof and smoke filled the foyer, prompting the building's evacuation. All train services have been suspended and a number of roads have been closed. 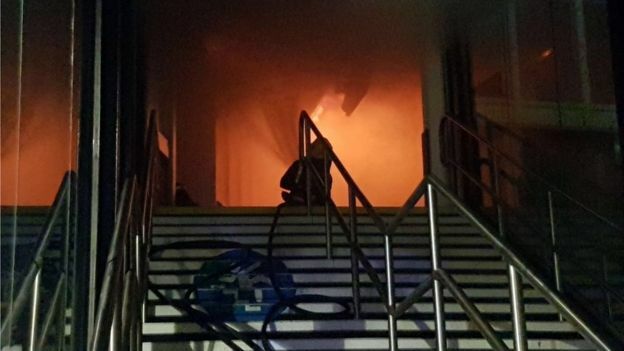 Incident commander Bryn Coleman, from Nottinghamshire Fire and Rescue, said crews faced "arduous" conditions when they arrived to tackle the "severe" fire that spread across the concourse. He said crews were still inside and trying to contain the fire between the new part of the station and the main building, describing the operation as "difficult and protracted". He added that the fire was believed to have started in a toilet. British Transport Police said it was an "ongoing incident" and could not say when the station would reopen. East Midlands Trains said while no-one was injured and everyone was accounted for, all services, including trains to London St Pancras, Liverpool, Leicester and Norwich, have been disrupted. About 4,600 passengers arrive at Nottingham station during each weekday morning between 07:00 and 10:00, according to the Department for Transport. The station has recently undergone a £50m redevelopment, incorporating a new tram bridge, including the restoration and upgrade of its Edwardian grade II-listed front building. Eyewitness Sarah McMullan said she saw smoke coming from a toilet at the station's car park. "You don't think much of it when there's a little bit of smoke and police already there, but then we were evacuated," she said. "It was pretty frightening to see how quickly a fire can grow. You can see billowing smoke and flames above the roof on the far side." 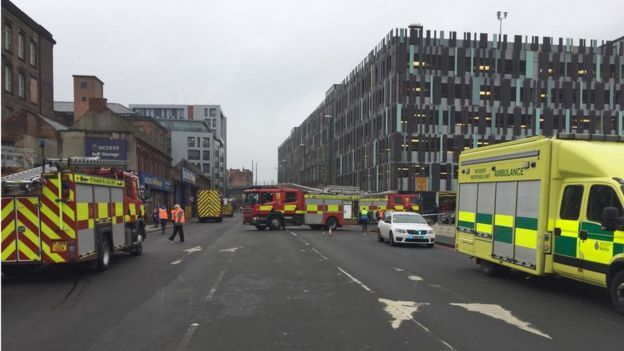 BBC Radio Nottingham's Andy Whittaker said he saw "thick plumes of black smoke" coming from the station. He said many people were left waiting outside the building after being told to leave. Dr Remigius Llione, 49, said: "I drove into the car park and I could already hear the fire alarm. "The smoke was so thick that you could not see in front of you." Queens Road and Carrington Street have been closed in both directions which created heavy traffic on surrounding routes, especially on London Road and Radcliffe Road. There have also been reports of 40-minute delays on bus services. A tram service has also been disrupted into the city due to a separate incident. There are no reports of any casualties, but many people have been inconvenienced. many people have been inconvenienced. He's here all week folks. It's being treated as arson. I'll bet it was arsoff pretty quickly though. My pun was unconscious, and in ignorance of the location of the seat of the fire. The report on the BBC news quotes a BTP spokesman as saying that sprinklers would have reduced this major incident to a minor kerfuffle (my paraphrasing, can't find the original piece). Oh, value engineering! A refurb costing £50 million wrecked by the lack of a sprinkler system that could have been co-fitted for a fraction. But then, who would have thought that a fire would have started in the womens' khazi, or that it would have taken so much to put it out? Sprinklers don't come cheap, and no-one died. Expect developments. I have no idea what they will. For some reason, this talk of women's toilets and sprinklers has reminded me of the initial reaction (as recorded by Samuel Pepys) of Thomas Bloodworth, Lord Mayor of London, to the start of the Great Fire in 1666. The report on the BBC news quotes a BTP spokesman as saying that sprinklers would have reduced this major incident to a minor kerfuffle (my paraphrasing, can't find the original piece). 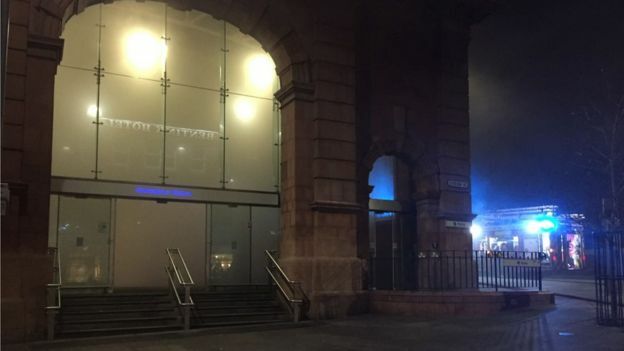 A woman has been arrested on suspicion of arson over the huge fire that closed Nottingham railway station. British Transport Police said the 33-year-old from Derby was arrested earlier and questioned by officers. Ten fire crews were needed to bring the fire under control after it broke out at about 06:30 GMT on 12 January. Nottinghamshire Police said the woman had been released under investigation while inquiries continued. 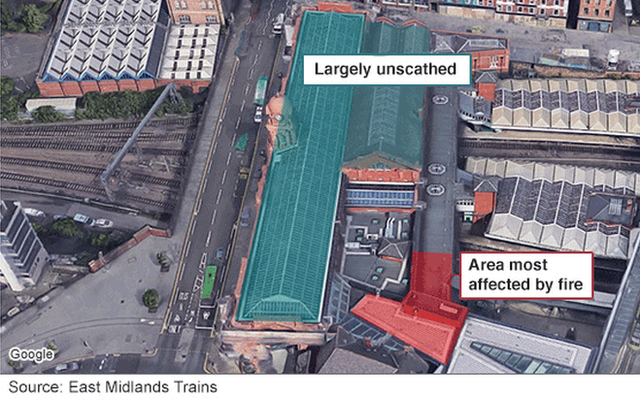 East Midlands Trains confirmed the fire caused "significant damage" to the station, part of which remains closed. Prior to the fire, which started in a set of women's toilets on the new side of the station, the main entrance to the station had recently been refurbished in a multi-million pound project between Network Rail, Nottingham City Council, East Midlands Trains and the Rail Heritage Trust. Last month, Bryn Coleman, an incident commander with Nottinghamshire Fire and Rescue, said the fire could have been contained more easily had sprinklers been fitted. He told the BBC the damage "would have been less" and could have avoided the closure of the railway station had they been in place. 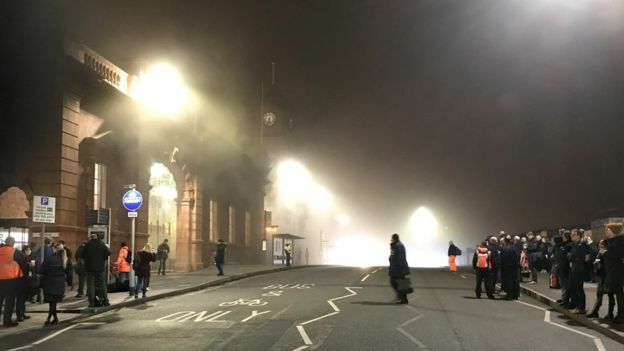 All trains going in and out of Nottingham were cancelled on the day of the fire, but the station reopened at 04:45 on 13 January and was running a "near to normal" service by the following day. British Transport Police is looking to speak to any witnesses who were around the railway station between 05:00 and 06:30 on 12 January.